Clara had a birthday slumber party over the weekend. It turned into a much larger affair than we had originally planned for. It was a fun party with 6 of her good friends, our wonderful next door neighbors, my family. We had one kid just show up uninvited and then was totally high maintenance the whole time...that was incredibly awkward (another guest told her about it and invited her), the neighbors deck spontaneously caught on fire during the party and Clara just happened to be outside to see it happen (and saved the day...caught it when there was only minor damage). Anywho, in the end just one girl was able to spend the night. And they had an epic pillow fight. It was fun to watch and capture. What fun - nicely captured! Oh we all have slumber party stories! This is such a cute capture! I like the person asleep on the sofa in the background, that’s says more about the event and the hour than anything. Smile. 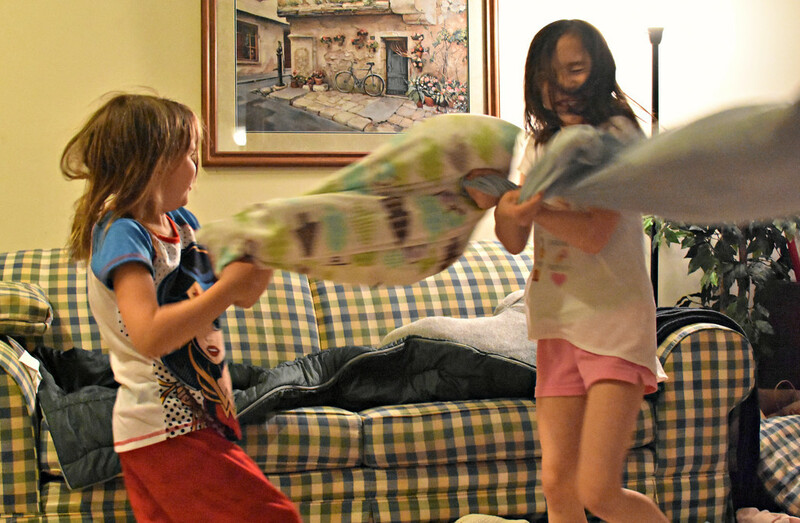 It seems the evening was as raucous as this pillow fight! Great action shot. Great fun and well captured action shot ! Great capture of their fun night. Two kids can always think up more than one, and 6, watch out. Captures the fun they had brilliantly. Great capture of the pillow fight...It sounds like Clara had a great birthday party :). This makes me smile and want to join in!